GORGEOUS LARGE SPANISH DUPLEX on a tree lined street in Hancock Park neighborhood - One of most beautiful 2nd Floor light filled Duplex's with a Center Hall, 2 Large Bedrooms, 2.5 Baths & Den/Bedroom. Numerous Built-in Book shelves & cupboards, linen closets/drawers. We dare you to fill the large walk-in closets! Enter an interior Spanish tiled curved stairway leading to a foyer. Hardwood floors throughout. Large Living Room w/Vaulted beamed ceilings & a gas fireplace, Formal Dining Room plus a Breakfast area. Central Air & Heat. 2 side/side car garage + permitted street parking. Features include: Washer & Dryer. Great neighborhood that's close to restaurants, theaters, parks, studios, shopping (Republique, Sycamore Kitchen, The Grove & Farmer's Market). 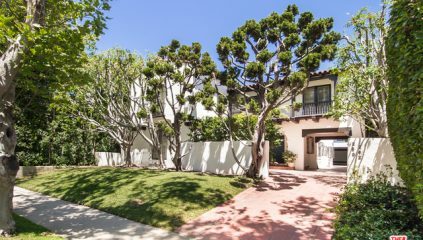 Close to downtown LA, & Larchmont Village. A front courtyard for reading & eating.